"Tri-band" routers have had an interesting history. Originally dubbed "XStream", tri-band (Band 1 = 2.4 GHz; Band 2 = 5 GHz Ch 36 - 48; Band 3 = 5 GHz Ch 149 - 165) was originally conceived by Broadcom as a way to buy time against MU-MIMO until they could get their own late-to-the-party MU-MIMO chipset to market. Broadcom's pitch, as described in MU-MIMO vs. XStream: The Coming Battle For Wi-Fi Airtime, boiled down to why buy something that also requires buying new devices when you can get the same or better benefit from our stuff that works with what you already own? There was apparently enough in that argument to get folks to buy into this new router class, which also pushed prices up to new heights. It also didn't hurt that the addition of another radio let Wi-Fi marketeers add in its maximum link rate to make the big number on the box (BNOB) even bigger. Prices and numbers on the box got even bigger with tri-band's move from three-stream to four-stream radios and still buyers bought. But then "mesh" Wi-Fi Systems became the shiny new object to attract buyers' bucks. Since tri-band technology was old news and there were no more tricks left to artifically pump up the BNOB, marketeers fell back to the other tried-and-true trick, lower price. I looked at NETGEAR's attempt at lower-cost tri-band in its R8000P Nighthawk X6S and came away unconvinced that, even with MU-MIMO also thrown in (oh, the irony! ), that it was a better way to go than NETGEAR's less expensive four-stream R7800 Nighthawk X4S. In the meantime, tri-band found its true calling in Wi-Fi Systems, which needed the flexibility and additional bandwidth a third radio brought to the party. NETGEAR went upscale to a four-stream radio and dedicated it to backhaul in its original RBK50 Orbi, while Linksys (Velop), eero (gen2) and others went with two-stream and shared it between front and backhaul, just like the other two radios. Ironically (again), it wasn't Broadcom that benefited from this new application of tri-band, but Qualcomm instead. Because all Wi-Fi systems to date are based on Qualcomm chipsets. 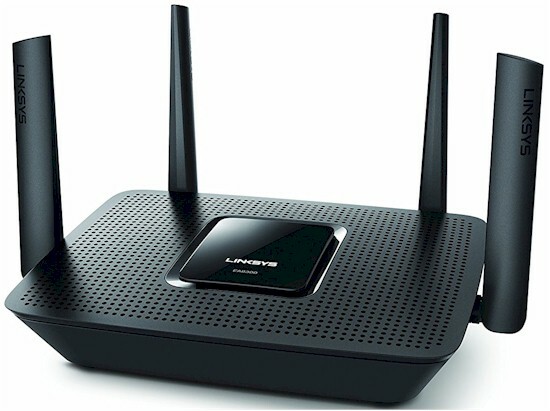 So now enters Linksys' EA8300 Max-Stream AC2200 Tri-Band Wi-Fi Router to bring it all full circle. It's basically the dual-stream Qualcomm tri-band design that forms the core of the Wi-Fi Systems mentioned above, but in the form of a standalone router. Linksys has played it straight with the AC2200 rating, which adds maximum 2x2 link rates of 400 Mbps in 2.4 GHz plus 867 Mbps for the two 5 GHz radios to get 2134 Mbps, which is rounded up. They sorta had to, since the EA8300's innards don't support the useless 160 MHz / 80+80 MHz bandwidth used to pump up the EA9300's BNOB. The EA8300 has only four non-upgradeable external antennas. There are mounting screw slots on the bottom panel to enable facing the rear panel up or down. The front panel callout diagram below describes the front panel lighting. The rear panel has one USB 3.0 port, four 10/100/1000 Mbps Ethernet LAN ports and one Gigabit WAN port. Port aggregation can be enabled in the admin GUI on ports 1 and 2 (I did not test this) and every port has its own link and activity LEDs that should be called out in the diagram. The right side of the router sports a Wi-Fi Protected Setup (WPS) switch. There is no wireless on/off switch. Linksys has released the FCC internal pictures, so I did not open the router for a look. The first photo, with top cover removed, shows heatsinks covering the key components, which I'll get to shortly. You have to squint a bit due to low photo contrast, but it's clear the left side two antennas are dual-band and the right pair are dedicated to the second 5 GHz radio. The radios are clearer in the photo below with heatsinks and RF can tops stripped away. The highlighted white rectangular parts are band-shaping filters and indicate the two 5 GHz radios. Component closeups in the FCC file allowed identification of all key components except the 2.4 GHz transmit power amplifiers. The table summarizes the key components for the EA8300 and Linksys Velop, to which it bears a close resemblance, including a (non-functional) Bluetooth 4.1 radio. So close, that the EA8300 list includes Velop's 2.4 GHz transmit power amplifiers as a guess. Also included are eero Gen 2 and the Orbi "mini", that use 2x2 backhaul vs. the original's 4x4, so you can see design similarities. Although the components are similar, the physical design of the EA8300 and Velop are quite different. The FCC photos show Velop's board has less space to work with, so put the IPQ4019 shared 2.4/5 GHz radios on one side and the dedicated QCA9886 second 5 GHz radio on the other.